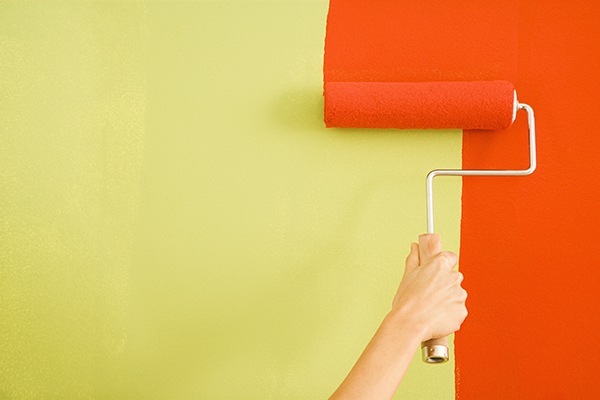 So, you’ve decided to freshen up one of the rooms in your home by changing the paint. But if you are unfamiliar with paint sheens, you may be unsure which finish is right for the job. One good rule of thumb to follow when choosing paint – the higher the sheen, the higher the shine, and the more durable the paint will be. And if you have chosen a dark and rich color, remember to go down one level on the sheen scale unless you want a super shiny effect. That’s because the darker and richer the paint color is, the more colorant it has, which boosts sheen. Read on for more specific descriptions of each type of finish. You may know it as flat or matte finish. This type of paint has the least amount of shine. It also goes on smooth over rough surfaces, making it a good option for textured walls. Because it doesn’t reflect light, a flat or matte finish paint is also a a great choice for hiding your wall’s small imperfections like bumps or cracks. However, this is the hardest type of paint to keep clean, so it is often not the best option for high traffic areas like the kitchen or bathroom. If you’re looking for more luster than a flat finish, choose satin finish, which is also sometimes called eggshell. This type of paint resists stains better than flat and can be easily wiped clean with a wet towel, making it more ideal for bathrooms, kitchens, kids’ bedrooms and playrooms, and other high-traffic areas. The downside – you’ll only want to do this job yourself if you are an experienced painter. Satin finish reveals every brush and roller stroke. Semi-gloss paint is tougher than eggshell. It easily stands up to water and frequent cleaning, making it an excellent choice for a kids’ bedroom or bathroom. This finish is also often used for trim, doors, and furniture. What’s the downside to semi-gloss? It reflects a lot of light when dry, so if there are any imperfections on your walls before you paint, they will definitely stand out. In most rooms, you’ll want to reserve gloss paint for window and door trim. It’s also a great choice for furniture, because of its hard and shiny finish. If you want to try rocking this style of paint on your walls, the kitchen is the best place to give it a try! High gloss paint can stand up to even more cleaning than semi-gloss, perfect for those sticky finger prints and oil splatters. Ready to paint? Check out this article on an unexpectedly popular shade!